Softening crude oil prices and weakening dollar provided support to the rupee. 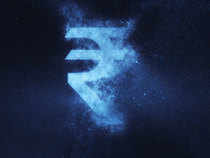 Mumbai: The rupee climbed 9 paise to end at 74.12 per dollar Thursday after tumbling to a fresh lifetime low in intra-day trade amid a sharp sell-off in global markets. Softening crude oil prices and the greenback weakening against other currencies provided support to the home unit, brokers said. Asian and European equities sank deep into the red after US markets reeled due to concerns surrounding global growth and rising bond yields. At the Interbank Foreign Exchange (Forex), the rupee opened lower at 74.37 and lost further ground to hit a record intra-day low of 74.50 against the US dollar on strong demand for the American currency from importers amid unabated foreign fund outflows. However, the rupee clawed back lost ground and finally settled for the day at 74.12, up by 9 paise, posting a gain for the second consecutive day in an otherwise volatile market. On Wednesday, the rupee rose by 18 paise to 74.21. "Rupee gained due to falling oil prices and slide in domestic bond yield. Oil prices declined in expectation of increased production and if this trend continues, the rupee may find some stability," Geojit Financial Services Head of Research Vinod Nair said. Brent crude was trading at USD 81.54 per barrel, down 1.87 per cent. The BSE Sensex slumped over 750 points to end at a six-month low, while the NSE Nifty ended below the 10,300 mark Thursday as global indices witnessed across-the-board losses. Meanwhile, domestic institutional investors (DIIs) bought shares worth Rs 1,892.94 crore, while foreign institutional investors (FIIs) pulled out a net Rs 1,096.05 crore Wednesday, as per provisional stock exchange data. "Though the crude oil prices have eased overnight, it is temporary. As US sanctions on Iran begin from November, crude oil prices might continue to rise in the international market. This may pressurise the rupee in coming sessions," said Rushabh Maru - Research Analyst , Anand Rathi Shares and Stock Brokers. The FBIL set the reference rate for the dollar at 74.3875 per dollar. The reference rate for euro was fixed at 85.9012 and for the British pound at 98.2961. The reference rate for 100 Japanese yen was 66.29.